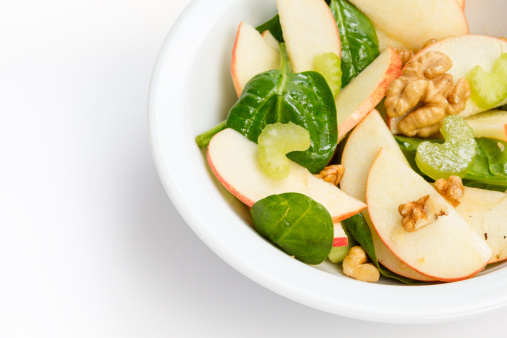 Try this spinach with apples and walnuts salad for a fresh and delicious combo of flavors and nutrients! Add oil to a medium skillet on a low heat. Add the walnuts nuts and allow to toast. Add garlic and apple and allow to cook for about 3 minutes, or until the apple begins to soften. Increase the heat slightly to a low-medium and add the spinach. Season with black pepper if desired. Serve immediately.